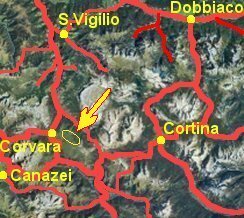 A long meadow-covered wide ridge stretching from Corvara - La Villa up to the Sett Sass, the Pralongià is a wonderful balcony with a view over several among the finest Dolomitic groups. 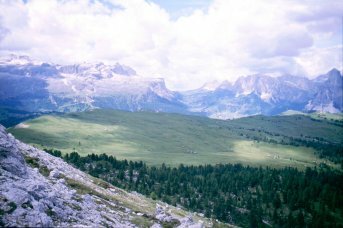 Mainly composed by tender marls and limestones of the Carnian, very rich of fossils, the Pralongià consists of a wide, soft- and flat-outlined plateau, surrounded by lofty mountain groups displaying their abrupt dropping cliff walls. Excursions: a paradise for alpine skiing in wintertime, the Pralongià can be accessed by lifts on all sides and is the scenery for several long, very easy walks. More interesting is the loop around the dominating Sett Sass, with many war remains.